Format: Turner Classic Movies on laptop. This is going to be an interesting 750-800 words. I’ve just watched House (Hausu) and I’m not sure I have a way to react to it. For clarity, I’m going to call it Hausu from this point forward to distinguish it from the 1980s horror movie House and the Hugh Laurie television show. Hausu is a psychedelic drug trip of a horror movie/comedy/fever dream. Things happen and there’s sort of a story, but I have no way to make sense of it at all without looking outside of the movie itself to the life and experiences of its director. I think I need to be chemically altered to even have a shot at it. So we’re in Japan at a girl’s school, completely with sailor uniforms. We’ll be dealing with a collection of seven students, each of whom goes by a nickname, and each of whom has a defining characteristic rather than a personality. Of primary importance are the fashion and cosmetics-obsessed Gorgeous (Kimiko Ikegami) and Fantasy (Kumiko Oba), who lives almost entirely in a fantasy world. Eventually we will meet the other five: the ready-to-fight Kung Fu (Miki Jinbo), the glasses-wearing Prof (Ai Matubara), the nice and genial Sweet (Masayo Miyako), the musician Melody (Eriko Tanaka), and the food-obsessed Mac (Mieko Sato). Summer vacation beckons, and the girls have plans. Six are planning a vacation together while Gorgeous is going to spend her summer with her father, a film composer who has just returned from a job. He has returned remarried, though, which upsets Gorgeous to the point that she decides to spend her summer with her friends. Their plans all fall through, though, so Gorgeous writes to her aunt (Yoko Minamida), who invites the seven to visit her. They go, and of course the house is haunted. The girls start disappearing as the house appears to devour them in a variety of ways. Eventually all of this is explained. And then it ends. I’ll be honest here, Hausu isn’t supposed to make a great deal of sense, and it doesn’t. It is instead a hallucinogenic fever dream. It feels like a live-action cartoon, or a horror movie created by Sid and Marty Krofft. It also plays like an early music video in a number of places. But there is something here, and it requires understanding why director Nobuhiko Obayashi created it, which requires knowing where he came from. Obayashi was born in Hiroshima in 1938, and thus was six or seven when the city was destroyed by the first war-time use of an atomic weapon. That’s what this is about. We get this overtly when we’re told the backstory of Auntie, who lost her fiancé in the war and spent the rest of her life waiting for him. It’s recalled throughout the film with flashes of light that appear in the eyes of the demonic cat every time something strange is about to happen. We see it in the animated body parts that inhabit the house and the giant flood of blood that attacks at the end. It’s finally confirmed at the end when Gorgeous meets her new step-mother again. This is a film about the bomb, about a generation that had to live through it and a generation that grew up in a post-war Japan after the bomb but without having lived through it. Hausu only begins to make anything like sense when it’s taken in this context. The opening half hour, which looks like a surreal advertisement to come to Japan represents the world experienced by the post-war, post-bomb generation, aware of but not really understanding the previous generation’s terrors. The house itself represents those terrors—nonsensical death that appears to happen at random, with destruction: imminent, unpredictable, and leaving nothing but body parts, blood, and ashes in its wake. It even explains the virgin/bridal theme that runs through the movie as a reaction to the destruction of the war and the thousands upon thousands of women who awaited men who never came home. The truth is, I liked Hausu before I learned that Obayashi was a survivor of the Hiroshima bomb. Knowing that, and having some context to put it in, I understand completely why this would be given a Criterion release. The imagery alone, the way the film is designed and plays would make it noteworthy on its own. Knowing the source of some of that imagery, or at least a possible coherent explanation from it makes Hausu something truly special in film. Truth be told, I’d love to see this on a big screen. 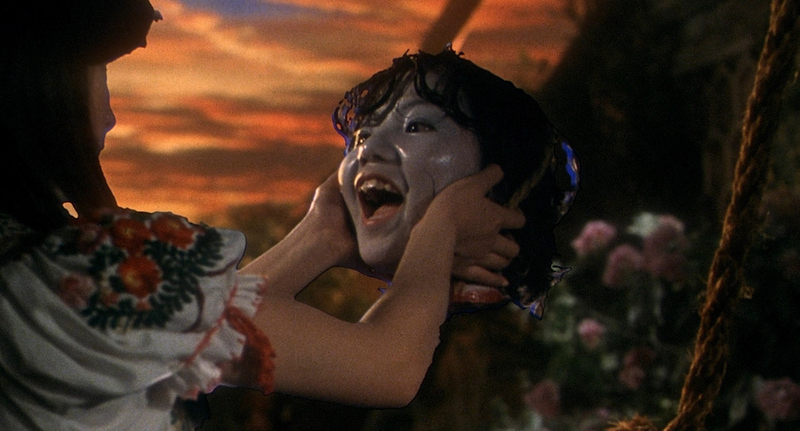 Why to watch Hausu: It feels like the precursor to about 50% of music videos from the 1980s. Why not to watch: It only makes sense in the context of Obayashi’s life. I was looking for some new horror movies to put into my Halloween season movie rotation and I came across Hausu and I love it! I left it on the DVR and I've watched it in October three years in a row. The other recent addition to the rotation that I watch every year is Eyes without a Face. And I try to watch Dead of Night every other year. I like all three of the movies you've mentioned. For me, the October must-see movies are 28 Days Later, The Devil's Backbone, and The Orphanage. X is the only one of those I know well, and I love it probably a little more than I should. I quite liked Hausu, too! I had to watch it for the 50/50 Project, I believe, way back at r2d2. It's a total trip of a movie, and I really wanna see it again sometime. Watch it with the Hiroshima reading. It actually kind of makes sense.